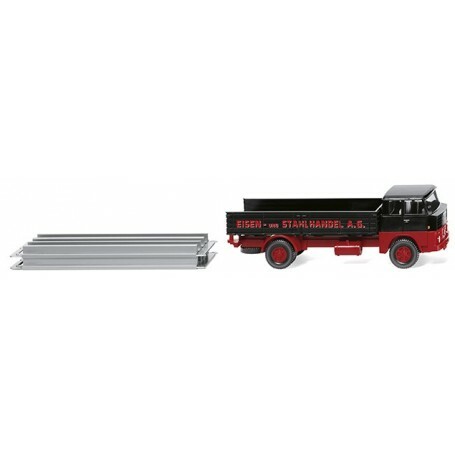 Flatbed lorry (Henschel HS 14/16) 'Eisen- und Stahlhandel A.G.', 1961. Upper part of driver's cab in black, lower part in fire red. Interior moss grey. Flatbed also in black. Chassis and cardan shaft as well as rear fenders and Trilex wheels fire red. Hand-painted headlights in silver. Front of driver's cab with orange indicators as well as Henschel star and headlights printed silver. Silver-painted lettering 'Henschel' at front on upper part of cab. Side of driver's cab also printed with orange indicators and with door handles in silver. Flatbed printed with lettering 'Eisen- und Stahlhandel A.G.' red with silver shadow. Two steel girder elements in silver.